Remember when I said I preferred my granola sans fruit and nuts? I may have spoken too soon. This granola, in all it's crunchy, lightly sweet, whole grain deliciousness, has converted me. 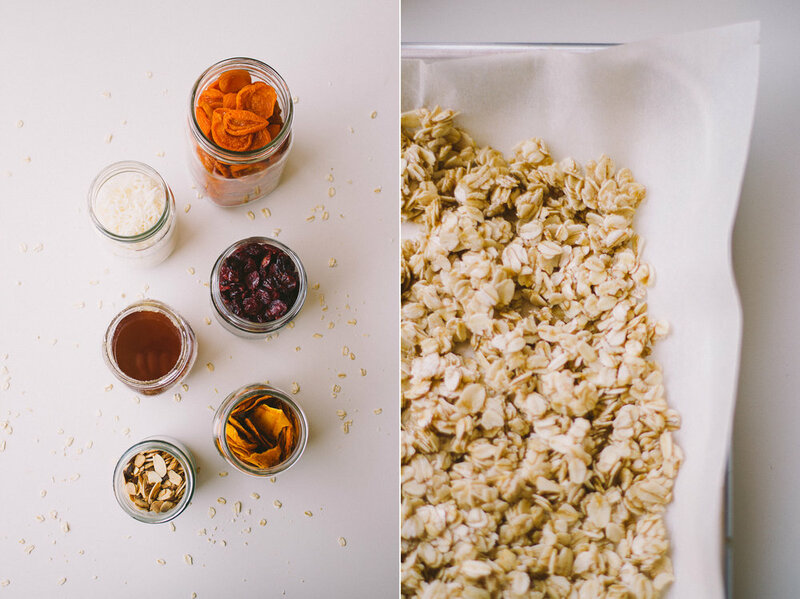 I had a similar granola a few months back at a conference I was taking photographs at, and fell swiftly in love. So much so, that I managed to ask for and leave with a bag of the leftovers... Rationing out the bag's contents for as long as I possibly could. I'd been meaning to replicate it in my own style for the blog for some time... But between my morning smoothie routine, and things being so busy this past month (graduations and birthdays every week kind of busy), any sort of blogging fell to the wayside. But here I am, returned to blogging, just in time to bring you this delicious granola... and on my birthday no less! Oats: Oats, oat bran, and oatmeal contain a specific type of fiber known as beta-glucan. Beta-glucan has been shown to have beneficial effects on cholesterol levels by removing it from the digestive system that would otherwise end up in the bloodstream. In laboratory studies, beta-glucan significantly enhanced the human immune system’s response to bacterial infection. Beta-glucan not only helps neutrophils (the most abundant type of non-specific immune cell) navigate to the site of an infection more quickly, it also enhances their ability to eliminate the bacteria they find there. So make this deliciously fruity granola, serve it up with some almond milk or yogurt of your choice, and eat some breakfast. Preferably outdoors, enjoying the first official week of summer. Note: If you like your granola clumpy, mix an egg white into the wet granola (during the honey and coconut oil stage) prior to baking. In a large bowl, stir together the oats, salt, and cinnamon. Add in the coconut oil and honey, and store until oats are throughly coated. Turn out onto a parchment lined, 13 by 18 by 1-inch sheet pan. Bake for 20-25 minutes. Remove from oven, and stir in the almonds, and coconut. Bake for another 10-15 minutes, watching closely and stirring every 5 minutes so that everything toasts evenly and does not burn. Remove the granola from the oven, stir in the rest of the dried fruit, and allow everything to cool on the tray, stirring every so often. The oats will crisp up as the granola cools. Store the cooled granola in an airtight container at room temperature for 3 to 4 weeks, the refrigerator for 6 weeks, or sealed bags in the freezer for up to 3 months. Enjoy!